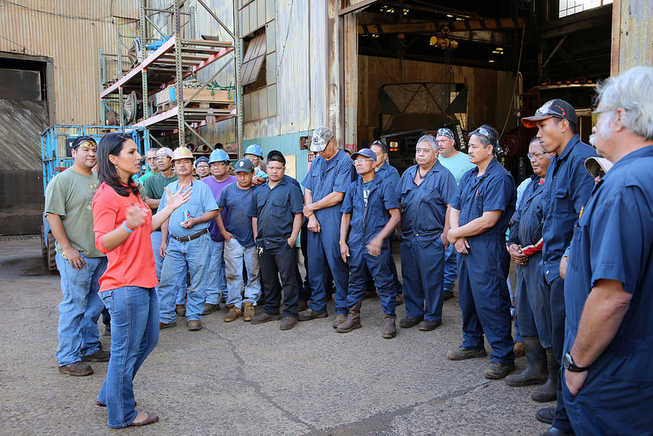 During a Congressional visit to Maui in March, Rep. Tulsi Gabbard (HI-02) visited with HC&S employees and met with leaders from ILWU Local 142 (Maui/Lānaʻi/Molokaʻi Division) to discuss the transition and support for Maui’s displaced sugar workers and others affected by the closure of HC&S. Photo 3.28.16 credit: Congresswoman Tulsi Gabbard. A group of concerned citizens in partnership with Maui United Way, has launched the A Hui Hou Fund to provide emergency relief assistance to HC&S displaced workers in need. “With growing concern regarding the over 600 employees that will be laid off due to the sugar plantation closure through the end of the year, Maui United Way has stepped up to launch a fundraising campaign to generate funds to provide displaced workers with emergency assistance, specifically supporting rental, mortgage, utilities, and educational needs,” organization executives said. Other members of the Steering Committee include Ashley Leahey, Carol Reiman, Yuki Lei Sugimura, Warren Watanabe, Saedene Ota, Thelma Akita Kealoha, Makana Rosete, Stephen Kealoha and Laksmi Abraham. President & CPO of Maui United Way, Laksmi Abraham said, “HC&S and their employees have been supporting MUW since the late 1940’s, and are believed to be our longest standing contributors. Just in the last 15 years, HC&S’s employees have contributed over $765,000 and their parent firm, Alexander and Baldwin Inc., has contributed $1,780,000 to Maui United Way. at Maui Thing, Maui County Federal Credit Union, and will be sold at Wailuku First Friday. The group has set a fundraising goal of $300,000 to be raised over the period from April 2016 to May 2017. The emergency funding period is from June 2016 to June 2017. 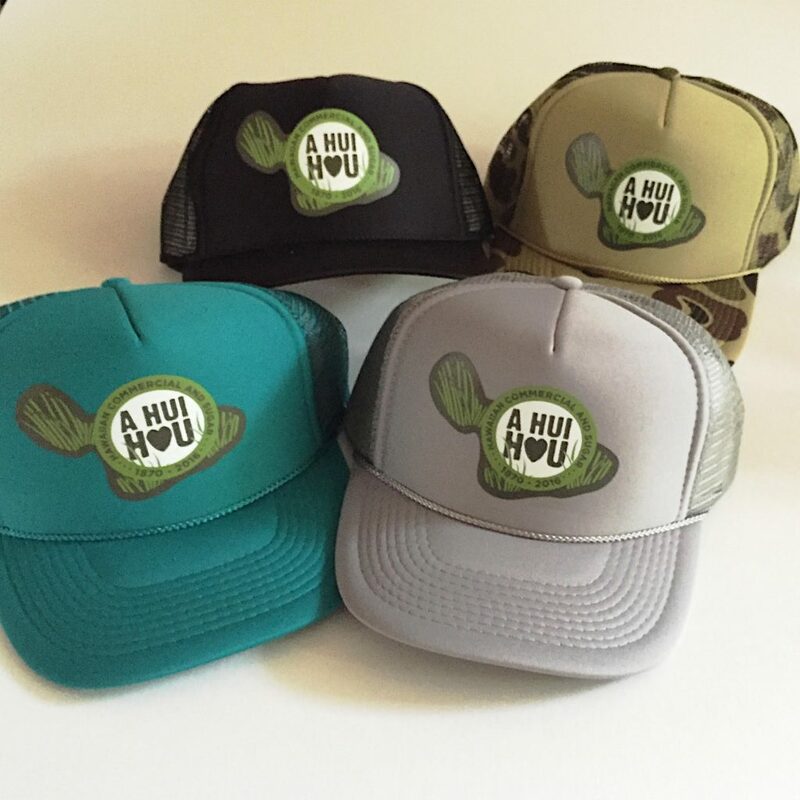 In addition to Maui United Way’s fundraising effort, the A Hui Hou Steering Committee will be selling commemorative t-shirt, hats, magnets and stickers. These items are currently available at Maui Thing, Maui County Federal Credit Union, and will be sold at Wailuku First Friday. 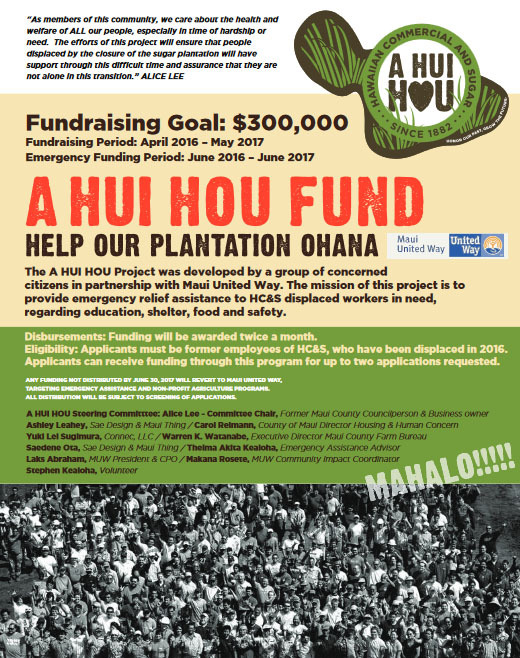 Click HERE  for a list of locations to buy these items, to volunteer a location to sell items or to make a contribution to the A Hui Hou Fund. Maui United Way will be accepting applications for emergency assistance from displaced sugar workers via their website as of July 1, 2016. For more information, affected individuals can contact Makana Rosete at (808) 244-8787. Each year, Maui United Way works to collect donations to support their 37 health and human service partner agencies. When donors give to Maui United Way they join thousands who care for our community. Our partner agencies provide services in critical community need areas including Education, Income (sustainability) and Health.